After living in the Middle East for the past 2 years, it is about time that I finally share my accumulated falafel knowledge with everyone out there! 😉 Who doesn’t love falafel? It’s like the basic of the basics for vegan people and SO tasty. These little chickpea balls are plant-based by default and home to many different countries in the Middle East. Usually, however, they are deep-fried and dripping in oil, which doesn’t make them the healthiest meal ever. 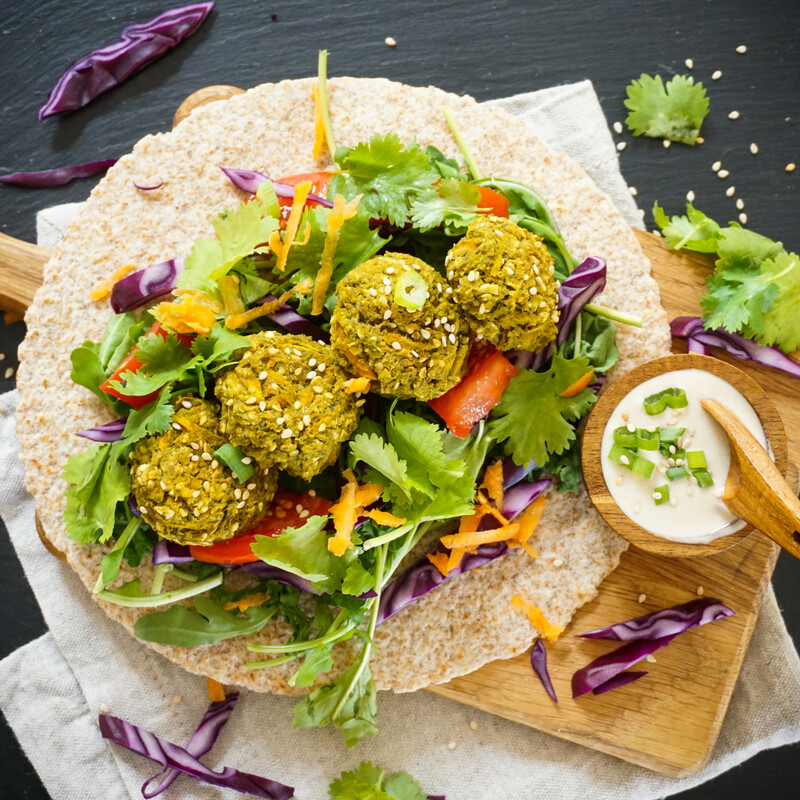 That’s why, I created my own healthy spinach falafel recipe and I hope you will like it as much as I do! 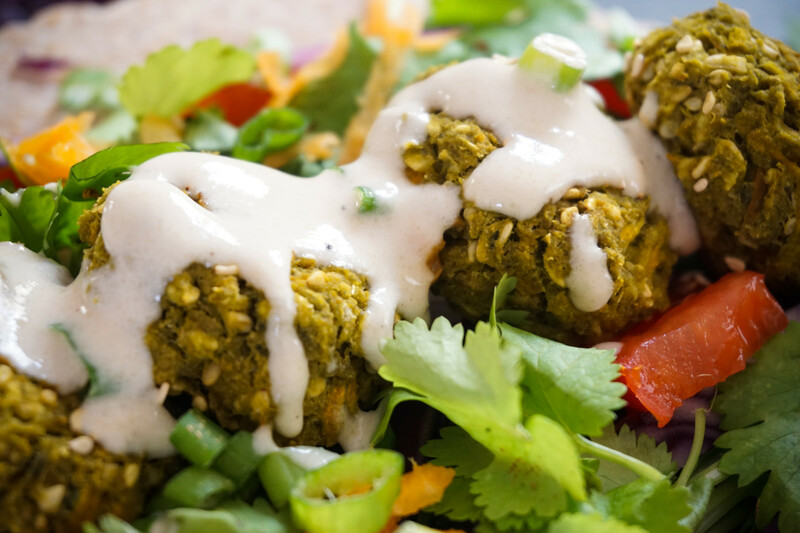 🙂 It is optionally gluten-free, oil-free and jam-packed with tons of iron, protein and fiber.Apart from being incredibly delicious and healthy, these spinach falafel are also so easy to make and barely take 10 minutes to prepare. Just throw everything in the blender, add some more flour for texture, form ‘dem balls and put them in the oven until they’re nice and crispy! 🙂 Easy as pie! 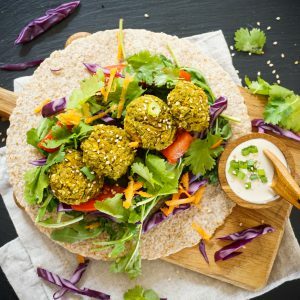 Personally, I like to put the falafel in a colorful whole wheat wrap, filled with fresh salads and veggies and top it with some creamy tahini sauce! So good! If you try this recipe, let me know! Leave a comment and rate it – it’s so helpful to me and other readers. And don’t forget to take a picture and tag it #thetastyk on Instagram! I love seeing what you come up with. Cheers, friends! Preheat the oven to 180°C/ 355°F and line a baking tray with parchment paper. 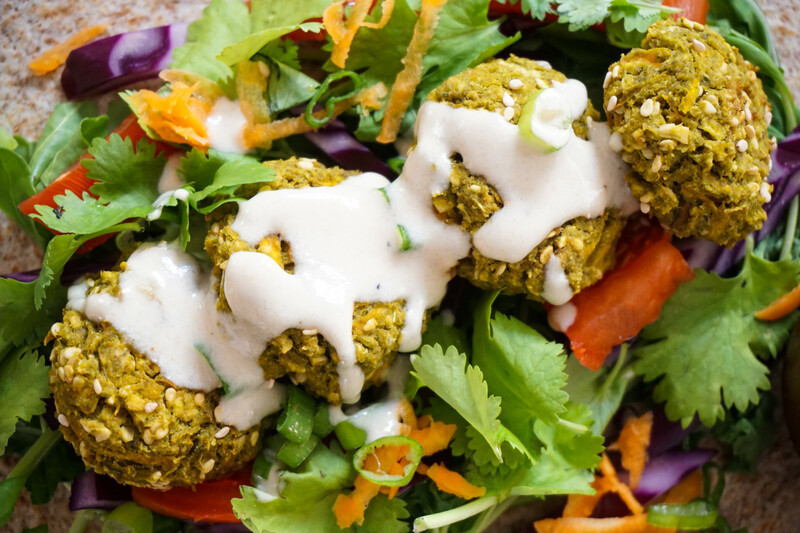 Place all the falafel ingredients, except for the carrots, sesame seeds and ¼ cup oats, into a blender and combine until you get a smooth mixture. Place the mixture in a bowl and add the remaining ingredients. Mix everything together with a spatula and start forming small shaped falafel balls (if still too sticky, add some more oats/ oat flour). Place the falafel on the tray and sprinkle some additional sesame seeds on top. Place the tray in the oven and bake for 30-40 minutes, flipping them half way through (the longer you bake, the crispier they get). In the meantime, prepare your wrap and the tahini sauce (simply mix together all the sauce ingredients until you get the desired consistency). 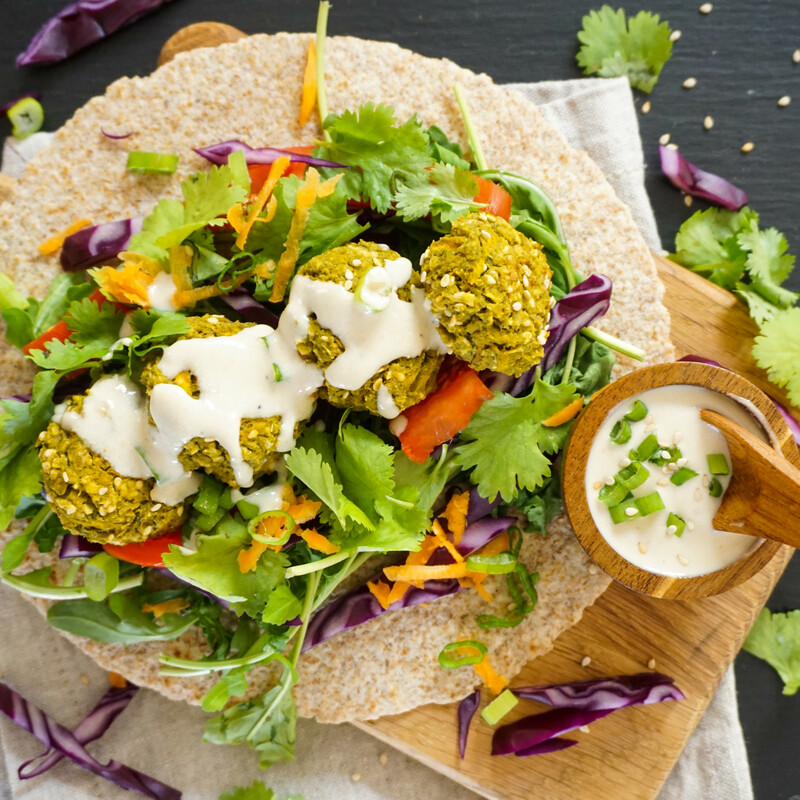 Once the falafel are baked, fill you wrap and enjoy! I LOVE this recipe! I turned it into a Falafel Salad Bowl, however, keeping carbs down:) Thank you SO much!! I could not make these into balls. I added the additional oats, but it was still too runny, so I just “plopped” them on the parchment paper! I didn’t want to keep adding more oats for fear it would affect the flavor. I used a Vitamin to blend so maybe it was too much? Meant to say “Vitamin!” Additionally, my sauce was not white like yours–it was tahini color–light tan. Did you use tzaziki? For the sauce I used regular store bought tahini, mixed it with lemon juice, water and pepper. I think there are darker and lighter tahinis though (as in whole wheat and normal wheat), so that might influence the colour! Do you cook them first then freeze, or shape freeze then cook when ready to use? Made these yesterday and just had them for my lunch with spinach, cherry tomatoes, seeds and hummus. Absolutely delicious. Thanks for a wonderful recipe!